For the crust, combine all the ingredients together in a small bowl and stir until the graham cracker crumbs are evenly moistened; the mixture will look like wet sand. Press the mixture evenly into the bottom and all the way up the sides of a 9-inch pie plate. Bake for 8 minutes until just lightly golden. For the filling, in a medium bowl with a handheld electric mixer (or in the bowl of a stand mixer fitted with the whisk attachment), beat the sweetened condensed milk, egg yolks, lemon juice and salt together for 2-3 minutes, scraping down the sides of the bowl as needed. Lightly tap the bottom of the bowl 2-3 times on the counter to pop any little air bubbles. Pour the filling evenly into the baked crust. Bake the pie for 10 minutes. Remove the pie from the oven and let it cool completely. Cover the top lightly with plastic wrap and refrigerate until chilled, at least 2 hours or up to overnight. 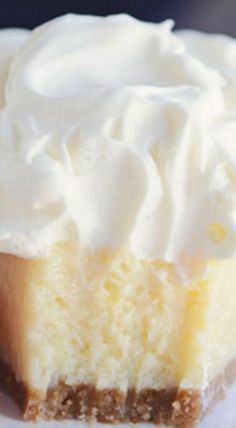 For the whipped topping, beat the cream, powdered sugar and vanilla together with a handheld electric mixer, electric stand mixer or a blender until it is fluffy and soft peaks form. Spread the whipped cream evenly over the pie or serve a dollop of the whipped cream on each individual piece. Garnish with raspberries if desired. I think this pie would be delicious subbing the lemon juice out for lime juice (or even orange juice!). I highly recommend using fresh citrus juice over bottled juice for a brighter, better flavor.